Some of the most popular misconceptions about x-ray inspection of food are tackled in a White Paper from METTLER TOLEDO - How Safe is X-ray Inspection of Food?, which can be downloaded free of charge. 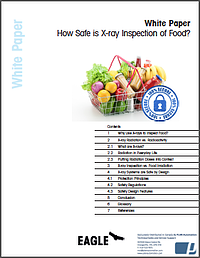 It is an indispensable white paper for food manufacturers who consider x-ray inspection to comply with food-safety regulations and legislations..
Why use x-rays to inspect food? What are the effects of x-rays to flavors, textures and nutritional value of food? What is the difference between x-ray inspection and food irradiation? How safe are x-ray systems used in the food industry? Despite this, some food manufacturers have still reservations about the adoption of x-ray inspection as a method of product inspection. They're worried that their staff will object to bringing x-rays into the workplace or that consumers might switch to other brands not subject to x-ray inspection. The paper uses layman's terms to explain the principles behind x-ray inspection and how it can help food manufacturers comply with national and international regulations. Yes, people are right to be wary of radiation, but this white paper dispels a few myths and delivers some surprising facts. 1 Why Use X-rays to Inspect Food?